This weekend's Northern Rockies Folk Festival is a homecoming celebration for a number of prodigal sons and daughters who have taken their musical talent on the road and are coming back to show off their street cred. "A lot of the talent started out in this valley and now they're coming back seasoned musicians," said organizer Pete Kramer. This 35th annual two-day festival set beside the Big Wood River in Hailey's Hop Porter Park will take place this weekend. It's a family friendly event with vendors, an arts and crafts fair within walking distance and camping in Lion's Park. The Kiwanis Car Show will be on at Roberta McKercher Park on Saturday as well. On Friday, Aug. 3, music will play from 5-10 p.m. starting with Steph Sloan & Elephant Parade, Olin and the Moon and Rosie Ledet and the Zydeco Playboys. Sloan was a star in "Fame, the Musical," here in June. Olin and the Moon just finished recording their first album, "Destroyer," and will bring out their new music. Ledet is a Creole zydeco accordion player whose nine albums sweat with the heat from her sultry lyrics. The Penny Hens start Saturday, Aug. 4, at noon, then Izzy Taylor (who has been stopping traffic at open mic events around town this summer), Dewey, Pickette & Howe, Gypsy River Haunts, Random Canyon Growlers, Carrie Rodriguez and headliner Jason Isbell and the 400 Unit. The Growlers always draw a crowd with their raucous shows while Rodriguez is all over the Americana charts and Austin City Limits. Isbell, is a former Drive-by Trucker known for his songwriting skills cloaked in rootsy rock. "I have to say, gosh, this is a killer show, an exceptional show that's just going to knock people out," Kramer said. 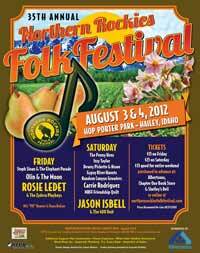 www.northernrockiesfestival.com for a discount, follow the directions for how much. Tickets are at Chapter One in Ketchum and Shelley's Deli and Albertsons in Hailey. The Hailey Chamber of Commerce handles camping at 788-2700 and people will be onsite to help. The festival website is loaded with music and information.